Moonlighter, developed by Digital Sun, is a single-player action RPG title with some roguelike concepts that is sure to get you hooked right away. It had a successful Kickstarter campaign, exceeding their $40,000 goal by $94,276 — even surpassing all of their stretch goals. The story follows Will, a wannabe adventurer who spends his days running a shop inherited from his parents. At night, rumored to be the best time to go into dungeons, Will seeks adventure by exploring. 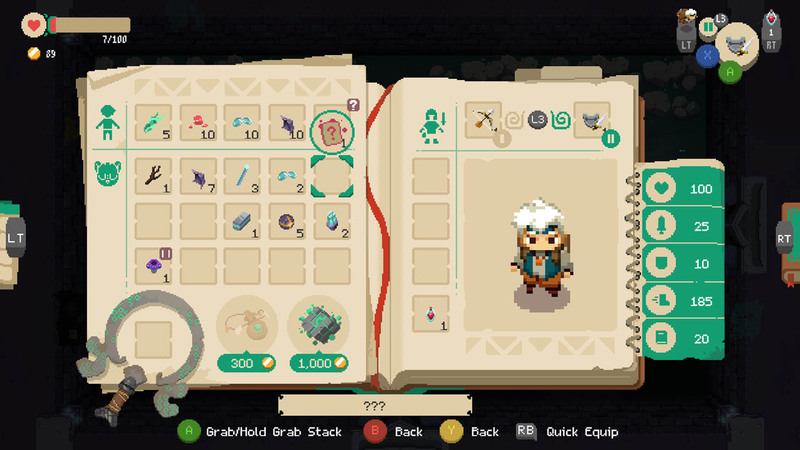 Your time in Moonlighter is split between adventuring in the dungeons, fighting monsters, finding treasure, and being at your shop to sell items you collect. You also help your dying hometown return to being the thriving place it once was. Every time you enter a dungeon the map changes. Adding some difficulty to the adventuring scenario, this prevents a player from memorizing where specific items, monsters, or treasures are located. Not to mention fast-tracking to the dungeon’s final boss is near impossible with the current set up. Don’t get too cocky: the dungeon may look simple, but one little mistake and it’s all over. Beware of not using your ability to escape dangerous situations, because when you die in a dungeon you can either start over or go back to town, but you don’t get to keep a majority of the items you gained while in the dungeon, forcing you to replay to get them back. The items collected in the dungeons are essential and sometimes will require you to make hard choices. Not only is inventory space limited, but some items also have secondary properties to them which may need a specific slot in your inventory to be carried. Some items also might destroy other items upon entering a dungeon, while some items can increase your armor just by carrying them. The decisions you make about what you put in your inventory is going to be difficult. Dungeons are not complicated in their execution — go in, fight monsters, get the treasure. However, there are other intricacies you need to be on the lookout for. Not all pits are bottomless, so looking for the sparkle in a pit is a good indicator that you might want to be bold and take a leap of faith into what could surely be your doom, because... sometimes it isn’t! Always be on the lookout for something that might not seem quite right to you. The other side of this game is your store and your town that you have to help rebuild. Taking the treasures that you earn from the dungeons, you can make gold by selling them in your store to your other townsfolk. There is no set price for items, which is part of the fun of Moonlighter. You have to figure out exactly what these things are worth. The easiest way to figure out if you are charging the best price for an item is to watch the townspeople who come into your store. Their faces will indicate what they think of the price you have currently set up. There are four basic options for what they might think of your rates, ranging from very upset to very happy. You are aiming for the second highest result which indicates a happy outcome. If one of your customers is very happy, then it means you have lost out on potential profit, which no merchant wants. Selling your items is a bit of trial and error, but once you’ve got it figured out the gold should start pouring in. Included in managing your store, you are tasked with reinvigorating your hometown. You can do this by adding upgrades to the town, such as merchants, a blacksmith, and so on. Adding these town upgrades is also a benefit to you. The blacksmith allows access to craftable armor and weapons, which in turn makes your adventuring inside dungeons that much easier. Adding an enchanter will allow you to customize your equipment by adding unique features. There are other vendors to add, each with their uses. Upgrading your store additionally helps you increase your income so you can continue to work on advancing your town. Managing upgrades to the town, your store, and adventuring makes Moonlighter more than just a one-sided title. The idea of combining adventure and merchant styles of gameplay was a genius move on Digital Sun’s part, making this a highly addictive game for those who enjoy multitasking. Gone are the days where you have to choose between a title that focuses on if you want to be an adventurer or a merchant. Moonlighter mixes the best aspects of both and brings an experience that is highly addictive and enjoyable. Beyond the gameplay, you are sure to enjoy the charming graphics and a delightful soundtrack. This is a fantastic first release for Digital Sun, full of high-quality graphics, music, and gameplay. Tash is an avid gamer, spending most of her free time at her computer playing whatever might fancy her interest at the time. Tash spends her days working in the Technology Industry where her love of Gaming and Computers is an integral part of her role. While she will play most any game, she is most often found absorbed in RPGs and/or MMOs.